VanDusen Botanical Gardens Festival of Lights doesn't get you in the seasonal mood, I really can't think of what would! Dull, rainy days of Vancouver winter got you down? The first winter I spent here was difficult after working in hot and sunny Saudi Arabia. So how did I contend with the gray days of winter? ... My camera and photography classes kept me going! Always something new to learn and photograph. This was my very first winter festival of lights... amazing! I was mesmerized by it all. 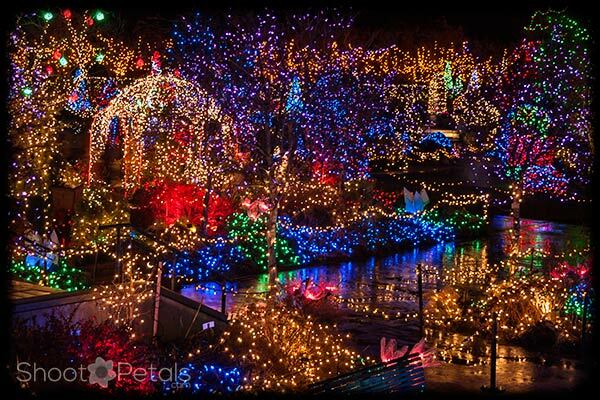 Make sure you take in the Dancing Lights shows on Livingston Lake. They start at 4:30... two different shows and they alternate. One's on the hour - the other on the half hour. And all kinds of food, hot cider and hot chocolate. Yep, I went for the hot chocolate! It was GOOD. By the way, all the concessions were cash only. VanDusen Botanical Gardens is one of my favorite gardens at any time of the year, not just for this seasonal festival. There are more images of this Vancouver garden gem and you'll find them right here. VanDusen Botanical Gardens Festival of Lights. Christmas trees on the pool. Reflections on the water. This pond is in front of Shaughnessy Restaurant at VanDusen Botanical Gardens. There's a huge covered porch outside the building. Its high enough to give great views of the garden lights for most of the video and photos I took. And, it rained off and on, so my photography gear was high and dry. A few things about this composition... The rope fence around the pool creates a diagonal line - one way to lead the viewer's eyes through the scene. I really like the glow of lights and trees on the water in the pool. All that rain has made the blocks around the pool really wet so there were lots of colorful reflections on the concrete, as well. By the way, moisture is not your camera's friend! When you're going into a warm, dry building, let the lens dry out and warm up before you put the lens cap on. If you don't, you'll trap moisture inside. You won't like the result. And when you go outside, you might have to wait a minute after you take your lens cap off. If your lens is warm and the air is damp and cold you'll get lens fog. Be patient or use a clean lens cloth. VanDusen Botanical Garden Festival of Lights. Picture from the covered porch in the rain. Some reflections in the walkways. 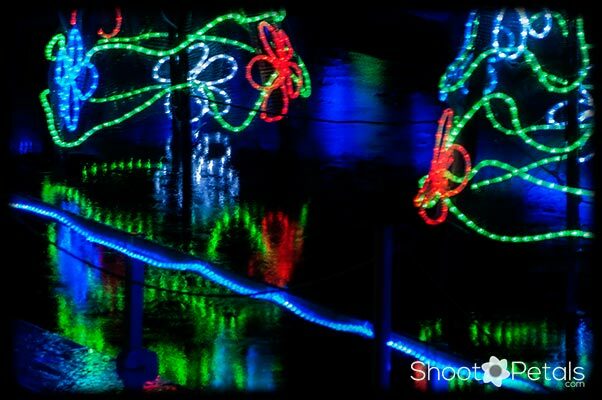 VanDusen's Festival of Lights. Picture taken with a shorter lens and includes more reflections in the walkways - taking advantage of the rain. This is the same view as an image above... except the focal length is different. My first photo was much tighter on the pergola and I missed out on a lot of the reflections on the walkways! The rain made the image so much better. I used my most versatile lens, telephoto 28-200 mm. I wasn't sure of what to expect, so a telephoto seemed like a good idea. And, with the rain, it's not a good idea to keep changing lenses, opening up my camera to the wet. A lot of photographers use a fixed focal length, like 105mm. or 35mm, maybe 50mm. A 50 mm lens records a scene as if you were looking with your eyes. If you have a telephoto lens, pay attention to what focal length you're using. If I set it to 135mm and it needs a small adjustment, I use my feet to make the scene fit! Try to pay more attention to the picture you're composing and this is one way to make you do that. Just a note about DSLRs... you might think you're using a 35 mm focal length but you're actually not. It is 35 mm on my film camera but on my D7000, all of my focal lengths are 1.5 times... 35 mm is actually the same as using a 52.5 mm focal length. Check your camera specs to find out about your own camera. VandDusen's Festival of Lights. One of many pathway decorated by thousands of lights. Shooting down the pathway to show perspective. 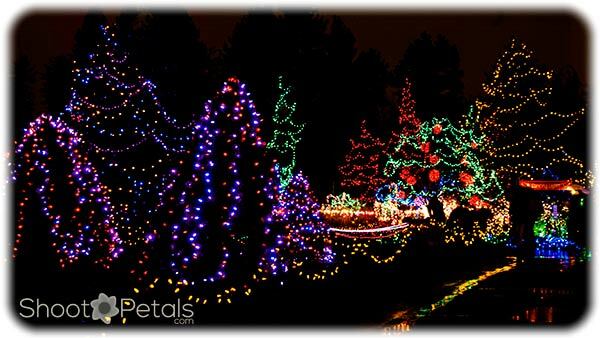 I haven't been to VanDusen Botanical Gardens Festival of Lights since they opened the new Visitors' Centre, though I have visited the garden several times in the summer. The previous building with Shaghnessy's Restaurant and the covered porch are still there so you can shoot from "under cover" if the weather is less than camera-friendly. 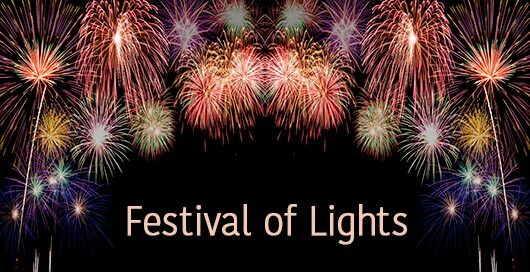 The festival grows bigger and better every year so come and enjoy the one million lights and the social activities. My only two tips are, first, get your night photography skills up to par ahead of time. Scout's motto... be prepared. You'll be much happier with your pictures. And second, venture out and see all of this stunning garden during this night festival, don't just stick around the front area or you'll miss many of the performances and light shows. 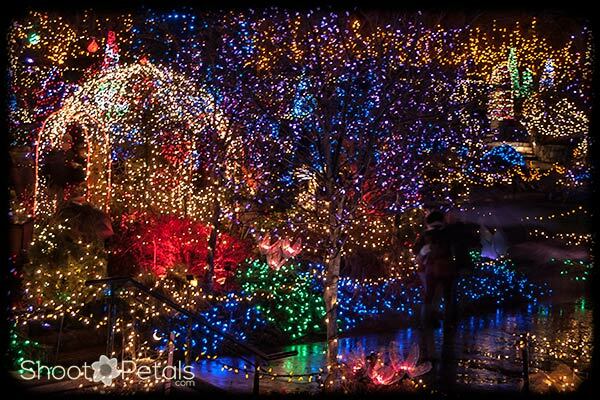 The garden website can keep you up to date on the Festival of Lights and other events.